Amazon is actually originated from the concept by Jeffrey Bezos. Amazon started to sell online in July 2005 and serving customers from 160 different countries. At that time, many people regard Amazon as the “Golden Child of the Internet” because it is a very successful online retailer. Amazon started off with selling books because Jeffrey thinks that purchasing a book does not require too many physical interactions of the customer with the product. Therefore, the tendency for customer’s rejection towards online purchasing in Amazon will be lower. All these while, Amazon only focusing in one important principle in order to be a successful online retailer and maintain their position in this competitive market place which is “The Customer”. Jeffrey believes that customer is the factor why Amazon can still survive nowadays even there are booming of online retailers. He knows that building long term relationship with customer will provide greater profit and revenue in the future. So, Amazon greatly emphasizing on providing superior customer service to the customers as satisfied customers will make repeat purchase and help the company to generate positive word of mouth. The success of Amazon is determined by the superior service quality and the features provided in the website such as powerful search engine with DWIM function and integrate technology called 1-click in the website. Amazon is trying to integrate customers to actively participate in the virtual community when they visit Amazon.com. Due to this, Amazon provides personalised web page and personalised recommendations to individual customer. Furthermore, customers have their own “Wish List” to put in the items that they are interested in. Customers are also encouraged to have social interactions with other customers, contact personnel and writers by joining online chat rooms and post review through Discussion Board. Finally, in order to ensure customer never forget about Amazon.com, Amazon also takes initiative to send a reminder to customer if the customer does not visit Amazon for certain length of time and provide book recommendations. 1. What is Collaborative Filtering and how it works in Amazon.com? According to Wikipedia, collaborative filtering is the process of making automatic predictions about the user’s interest based on the previous group of customers with similar taste characteristic. The concept is that, the customers who have similar purchase patterns will seem to purchase similar items in the future. All the predictions will be specifically recommended to specific user but the information is gathered from many users. 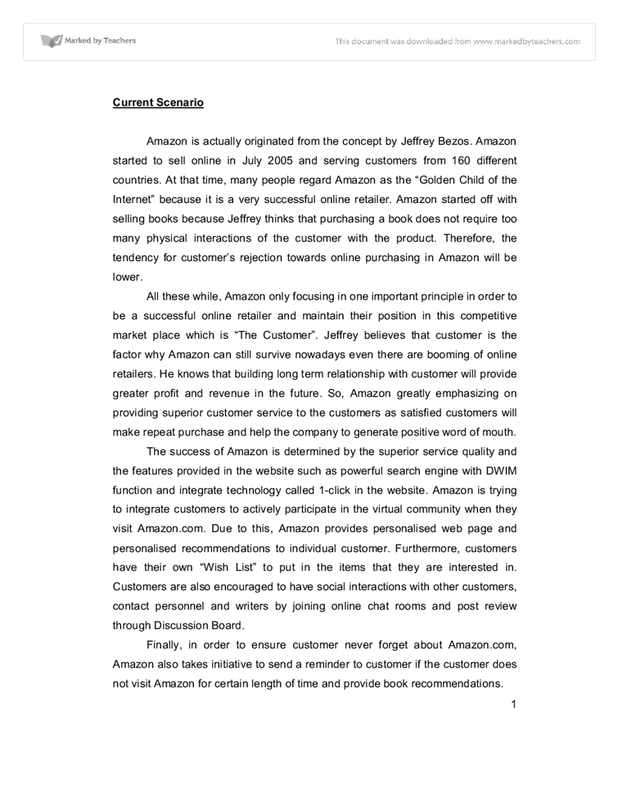 Applied to the Amazon.com case study, the website is using this method to provide recommendation to customer based on majority of the customers characteristic that have the similar interest in similar item. According to the case study, the software determines what other books those are popular with the people who read the same books. For example, in Amazon’s website, it is using the item-based collaborative system to make suggestion to the customers through ‘the customer who bought this also bought’. In short, Amazon actually uses collaborative filtering by matching the purchasing and browsing pattern between users. Then, Amazon will provide customer with future purchase recommendation. 2. What is a ‘Wish List’ and what is the purpose of it? A wish list is a service provided by Amazon to their customers. It is a place reserved for individual customer to list down the books that they personally wish to have in the list provided. Amazon provides this service so that other customers who planned to give a gift to other customer (their friend or family) in Amazon can actually review their personal list and buy the book that their friend or family wish to have instead of buying other items that might not be preferred by the recipient. 3. What is service customisation and how Amazon utilizes it to enhance customer’s shopping experience? Service customisation can be defined as service that is personalized or modified in order to meet certain needs of individual customers. Amazon.com utilizes service customization as a differentiation strategy for the company. 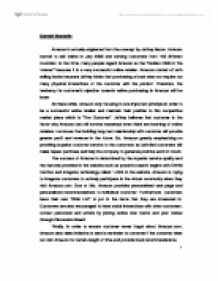 According to the case study, Amazon’s guiding philosophy is to provide superior service to the customers. Their focus is on the customers. So, Amazon builds relationship with its customers by letting the customers to know that they are personally unique and special to the company. And one of the ways to let them know is by customizing Amazon’s service according to individual customer. Amazon realises that customers like to be treated with respect and like the feeling appreciated. Due to this, Amazon provides service that makes personalized recommendation to individual customer based on the customer’s past purchasing pattern and past customers that have purchase the similar books. This can enhanced the customer’s shopping experience since the recommendations can help him to spend less time to search for books that he is interested in. Furthermore, according to the case study, Amazon has created a personalized web page that greets the customer by name once the customer visits the website and he can have the privilege to view the new recommendations made by collaborative filtering tool. With this service, the customer feels that he is being appreciated as a customer and have a sense of belonging to Amazon.com. 4. What are the services that Amazon.com is offering to enhance customer shopping experience? In order to enhance customer shopping experience, most of the services that Amazon offers require customer active participation. Amazon has provides a Discussion Board service in the website so that customer can view other reader’s comments about specific books. Furthermore, customer can chat with other participants in the Discussion Board. It provides an opportunity for the customers to build relationship and exchange information. Thus, this will creates some social activities that all these while the online organization is lacked of. Customer no longer is the only one involved in the transaction. Instead there will be other customer who will be chatting with the customer through online. The best thing is that there is an Author’s corner in the Discussion Board service. Customer can chat and ask questions to the book’s author. This creates a good opportunity for the customer to get to know the author and chances are not always available especially to those who visit the traditional bookstore. Amazon also creates a ‘Wish List’ for the customers. Whenever the customer has certain books that he wants, he can add it in his personal wish list. This wish list will serves as a guidance of what to buy to the customer’s friends or family. For example, if a customer wanted to buy a gift to his friend, he can search through his friend’s wish list, select the book and purchase it through Amazon and Amazon will send the book to his friend’s house. With this service, the customer feels that it will be easier to buy gift to their friends or family since this is the books that their friends or family wanted and he will not ended up buying the wrong gift. Besides, Amazon also makes personalized recommendations to the customer. With the use of collaborative filtering, the customer will be provided with future purchase recommendations based on customer past purchases or other customer’s purchase with similar characteristic. This service makes customers life easier since they need not to search through the whole website in order to find books that they are interested in. Furthermore, if the customer purchase the 2 books together (the book that customer wants plus recommended book), special price will be given and customer can save money while having the books that he likes. In order to make customer feel unique and appreciated by the company, Amazon make personalized web page. When the customer visits Amazon.com, the web page will greet the customer by name and allow the customer to view the new recommendations by collaborative filtering. Furthermore, with 1-click technology (the customer need not to click 2 times like they used to do in other online websites to reconfirm the information given), the customer need not to re-enter their personal information every time he needs to make purchases which will increase customer’s convenience especially those customers with hectic lifestyles. With this service, customer can reduce the time they spent on buying in website. Not to forget about Amazon’s powerful search engine. Amazon uses the ‘Do what I mean’ (DWIM) search function. The basic purpose of this search function is to correctly display the book’s title even though the customer might type in the wrong spelling or do not type the name of book or author correctly. The search function will recorrect the For example, if the customer typed Kotler as Cotler, the book list will still appear on the screen. With this service, the customer still can search the books that he wants even though he does not type in the correct name in the search engine. Amazon did a very good job in this because there are many times customer tend to misspell the book’s title or author’s name because couldn’t really remember the spelling exactly. This will reduce customer effort to search through the website and enhance the website’s ease of use. Furthermore, the customer can actually track their recent orders through a “Where’s My Stuff’ link at the bottom left of the Amazon’s main page. The customer can actually track their orders after they paid for their items to ensure that the item is on its way to the customer. This service actually enhances customer satisfaction since the customer can actually check their product’s location after they had made the payment. At least, it gives assurance to the customer that his product will be shipped after the payment has been charged to their credit card. Due to this, the customer needs not to wait blindly and will not have to suspect whether Amazon has ships the item or not. In short, it reduces the customer’s perceived risk. Finally, the shopping cart provided by Amazon is one of the services that will enhance customer’s shopping experience. The shopping card will “remember’ all the books or items that have been placed in the shopping cart by customers. This means that even after four months, the items in the shopping cart has not been deleted and still in the shopping cart. Customers need not to search back the books or items and worry that their items are no longer in the shopping cart after a few months does not log in to Amazon.com. This service enable customer to group their items into large orders in one shipping so that can reduce their shipping cost. This enhances customer experiences since the customer knows that Amazon designed the website with the customers in mind and emphasize on providing the best to each and every customers in Amazon. 5. What is a click and mortar? According to Fitzsimmons and Fitzsimmons, “click and mortar” firms represent traditional retailers that have extended their market reach by adding a website. It acts as a supplement channel. Delivery of items can be made from a regional warehouse by mail or within urban areas by truck from the local store. 6. What is a brick and mortar? According to Fitzsimmons and Fitzsimmons, “brick and mortar” is a traditional store whereby the customer chooses to order a product either by phone or online, and the local store will deliver it that day. The customer can also visit the store to make the purchases personally. How would you contrast Amazon’s business model with that of Barnes & Noble before Barnes & Nobel went online? Customers have a problem of buying books when they stay in remote places. It is very likely that there will be limited bookstores or limited choices in bookstores located in remote areas. The customer will have to travel to bigger city bookstores to buy books that they want which will cost them time and money. Customers also have problem buying books which are rare to find. These books can be only found through searching different bookstores to see if they have the title. This kind of searches can be very time consuming and may result in the book not being found. Customers will also have to take time out of their lives to search for books at a bookstore. Busy consumers may not have the time to browse through the entire bookstore and may miss out on some books that they may like. Customers will also have to purposely travel to bookstores which may not be convenient for them. Customers have difficulties in finding books in an unorganized bookstore or a bookstore which carries a very large collection of books. Amazon is an online bookstore which can cater to consumers everywhere regardless of location. All that is required is that the consumer owns an internet line. Consumers in remote areas will no longer have difficulty buying books and travel to other locations just to buy books. Amazon’s emphasis on excellent customer service also helps customers who want to buy rare book. As stated in the case, an Amazon employee helped a customer look for his father’s book which has not been printed in 20 years. This service provided by Amazon will help consumers a lot of time and money which would have been spent searching for the books. Being an online bookstore, Amazon strives to make it easier for consumers to purchase books. The consumer does not have to leave the comfort of his home to make purchases. The books will also be shipped directly to the customer’s doorstep. Besides that, Amazon’s online format also makes it easier for customers to browse through the wide selection of books available. Customers are able to enjoy savings on purchases. Amazon can sell books at cheaper prices because it has lower operating costs due to its fully digital format. Customers can also shop at their own convenience without travelling or adhering to a specific time (physical store’s operating hours) set by the seller. The customer also enjoys being able to view a wide variety of books. Amazon’s simple yet effective search function makes it easy for customers to find the books they want. Barnes & Noble is a physical bookstore which has many outlets around the United States. The purpose of having many outlets is so that Barnes & Noble will be able to cater to consumers in different locations. Barnes & Noble attracts customers to visit and stay in its stores by providing a comfortable place to read and browse through book titles. Barnes & Noble also places its bookstores in popular places like shopping malls and busy areas so that it will be more convenient to customers to. However, as physical stores require large amounts of investment and financing, Barnes & Noble only has stores in places which have a relatively high population. Barnes & Noble bookstores also stock a large variety of books so that they can cater to most of the consumer needs. Barnes & Noble tries its best to stock popular books which are often sought after by customers so that customers do not leave the stores disappointed. Customers can enjoy looking through and reading books in comfortable surroundings. The large number of Barnes & Noble outlets makes it convenient for customers to visit them. The locations of Barnes & Noble stores also provide convenience to customers as the stores are located in easy to find areas. Besides that, consumers also can choose from a wide selection of books which are organized neatly in the store. Amazon is targeting innovators. Innovators are a consumer group who use and adapt to new concepts before anyone else. Innovators are also known to have higher income levels and spending power. Amazon is targeting this group of consumers because they will be more likely to change from buying books in traditional bookstores to buying books online. This group of consumers is targeted because they are willing to take risks with new concepts and have the discretionary income to do so. Amazon is also targeting early adopters. Early adopters are consumers who adapt and use new concepts before most other consumers but only adapt after there are references from innovators. Early adopters usually represent a much larger population than innovators and also have high spending power. Amazon targets this segment because of their size and willingness to try new things. By providing an alternative method to purchase books, Amazon has also targeted consumers who are very busy and value convenience. These groups of consumers are people who want to buy books but do not have the time to go browsing in bookstores. Amazon has provided them with an easy, hassle-free way to purchase books. Barnes & Noble is targeting the early and late majority groups of consumers. These two groups of consumers usually wait until a new concept is proven successful by earlier adopters before using the concept themselves. Barnes & Noble targets these consumers because the company knows that if it can continue to provide excellent service and satisfy the needs of these consumers, these consumers will stay loyal and not switch to other competitors. The company knows that these people are risk adverse and will continue to be customers of the company so long as the products and services meet their expectations. Barnes & Noble also target the laggards. Laggards are consumers who try not to use new product or concepts if they can help it. Barnes & Noble target these consumers because the company knows that they do not like change. As a physical store, Barnes & Noble is providing a secure, familiar environment to these consumers. Besides that, Barnes & Noble is also targeting people who enjoy bookstores. There are consumers who enjoy spending time in bookstores browsing through books as a hobby. There are also consumers who have a lot of leisure time and want to relax reading and browsing for books in bookstores. Barnes & Noble’s physical bookstores cater to these consumers by offering them a comfortable environment to spend time in. Amazon is implementing strategic innovation where the company seeks to create new competitive fields in business. This strategic innovation method also focuses on making the customer happy by meeting the customer’s needs. This approach has high revenue potential and is initiated by the company after careful planning. Barnes & Noble is using the incremental innovation approach where the company changes its operating methods incrementally. This shows that Barnes & Noble does not want to take huge risks by changing its operating methods because the company is afraid that customers may not like it. This approach allows Barnes & Noble to increase its competitiveness within the current markets. Amazon is practicing a low cost strategy. By using only online stores, Amazon is able to reduce operating expenses such as rental, distribution channels and number of employees. By using the fully online format, Amazon also holds fewer inventories than traditional bookstores. Being a fully online store also means that Amazon deals directly with customers without intermediaries. Amazon courier’s books directly to the customer’s doorstep once all payments have been made. The use of technology and the internet has also helped Amazon utilize this strategy. The internet has made it possible for Amazon to set up its online store and reach customers globally. Technological innovations have also allowed Amazon to create an easy to use website. Technology has also helped Amazon include a search function on its website which help customers search for books they want faster. All these features allow Amazon to transfer cost savings to their customers, thus charging lower prices. Barnes & Noble practices a hybrid business strategy which consists of cost leadership and differentiation. Because Barnes & Noble has many outlets around the United States, the company buys books in bulk from suppliers. This enables Barnes & Noble to set lower prices than other bookstores. The pricing method of Barnes & Noble allows the company set competitive prices which will attract customers into stores and compete with other traditional bookstores. Barnes & Noble also controls its labor force so that it hires only a necessary amount of people to run the stores. Employees are trained to be efficient and effective in their jobs so that only a minimum number of workers need to be hired. This is to reduce labor costs of Barnes & Noble so that the company can effectively utilize its cost leadership strategy. Barnes & Noble also uses the differentiation strategy. The company has a long history in the industry and has good relationships with its partners. Barnes & Noble is able to differentiate itself from its competitors because it has a strong brand name and history. Customers will be more trusting towards a company with a strong background because it has proven itself over the years. Barnes & Noble also has good relations with its suppliers because they have been doing business over a long period of time. This enables Barnes & Noble to stock books faster and at less cost compared to its competitors. The good relationships between Barnes & Noble and its suppliers also allow the company to buy rare and limited edition books. This in turn will attract customers to stores because these hard-to-find books can only be bought at Barnes & Noble. Compare and contrast the shopping experience at Amazon.com vs a traditional book store. In Amazon.com, the servicescape is the layout of the website. The components which affects the customer shopping experience is the colour used in the website, the font, font sizes, the links and the ease of use. In Amazon.com, the background colour is white, so it can be considered as a safe colour since white is a common colour and the customer will not feel reluctant to white colour. The font and font sizes are appropriate since the customer can read each word clearly. Every main point will also be bolded or underlined to attract customer’s attention. The first page that the customer views when he visits the website is the homepage of Amazon.com which has the Amazon’s logo at the upper left. Furthermore, the categories of the products and the types of products in each category are listed clearly. Due to this, the customer can easily search the products that he wanted without the need to search through the website pages one by one. The latest, most popular products, discounted items, features and services provided, shipping return plus return policy, the link to track the recent order, link to download movie and TV shows started at $1.99, Amazon’s daily blogs, search box, link to return policy and the link to contact the help department are all listed in the homepage. Amazon has provide convenience to the customers since all the website’s link are detailed enough to help customers to explore Amazon.com. Customer may even participate in the Discussion Board service to view the comments from other readers of certain books. When the customer purchase through Amazon.com, confirmation email will be sent to the customer as a proof of purchase. The details included in the email include the postage tracking number, order number and estimated delivery date by Amazon. This is to provide assurance to the customer that Amazon has received their order. But the systematically arranged layout might also create some confusion to the customer who visits the website for the first time. There are too many information and links provided by Amazon and the new user is still not familiar with the layout since Amazon’s website is systematically arranged according to product category but complex in terms of the details of information provided to customer. In the traditional bookstore, the servicescape include the physical environment of the bookstore and contact personnel. The first thing that the customer sees when the he reaches the entrance is the bookstore’s logo and name. Then the customer can see the counter that is in a good condition at the left hand side with friendly and helpful employee standing at the counter. This creates a good impression to customer that the bookstore’s employee is ready to serve the customer with respect even though it is only a small bookstore. There are only few rows of shelves with limited aisles space since the bookstore is not spacious. The other books shelves are labelled and categorized according to the type of books so that the customer can browse through the products easily and spend less time to explore the store. There will be technology equipment such as computer to help the customer in searching for the books that he had in mind. So, if the customer wanted to search for book that interested him, he needs to walk around the bookstore and it will be time consuming since he needs to look at the shelves one by one. If the customer wanted to ask for assistance, he needs to ask directly to the store assistant. The lighting and the wall are white in colour to ensure that the customer can read the words comfortably without straining their eye and feeling tired. Soft and relaxation music is played in the background so that customer will feel comfortable and take their time to enjoy while browsing through the books. Air condition is also provided so that the customer will not feel too hot and leave the store. However there will be only few sitting places provided to the customers since the owner of the bookstore did not encourage the customers to stay in the store for too long. When customer paid for the product, a receipt will be provided as proof of purchase. The receipt will include the book store’s name and contact number, date of purchase, book’s title, quantity purchased and the amount paid. The accuracy of billing statement will play a part in contributing enhance customer’s confidence and trust toward the book store. Physically, customer only interacts with his personal computer. So there will be no other customers physically present to influence the customer’s shopping experience. However there will still be ongoing social activities involved. The customer can actually participate in the Discussion Board to chat and exchange information with other customers. The customer can also take his own time to explore the website then purchase the products in Amazon.com by credit card. The customers no need to wait for other customers to pay. Furthermore, the customer will experience more privacy and free from the disturbance due to other customer’s behaviour and action. The customer also needs not to wait for the contact personnel to answer question due to huge crowd since all the inquiries are send through email to the contact personnel. However, the negative impact due to shopping through website is that the customer might feel boring because there will be no other customer to be physically present around and customer cannot see the customers’ expressions and gesture. Customer will be physically present at the traditional bookstore. Due to this, other customers’ actions or behaviours might influence the customer’s shopping experience. The impact can be negative or positive. With other customers around, the customer can feel that he is in a comfortable situation to search for books since people who visit the store has similar hobbies and interests. Furthermore, he can interact with other customers and exchange information regarding the latest books that is recommended as best seller and discuss about certain topics in the newspaper (Example, politic, environment or social activities) or story line of certain books or magazines. With other customers, the experience of being physically present at the book store becomes more entertaining since the customer can see the face expressions, gestures and actions of other customers. However, the situation is not good if there are children running around and there are certain customers who like to talk loudly or rudely in the bookstore. This situation will distract the customer from reading or even choosing books. The customer will start to feel irritated and hope to leave the store as soon as possible. If there is a huge crowd, the customer even needs to wait for quite a long time to be served. In virtual world, with just a few clicks, the customer can reach their destination which is the website that they desire to visit. The same applies to Amazon.com. Since Amazon is a 100% online organisation, the customer can view the website anytime and anywhere. Wherever there is internet access, the customer can visit Amazon.com. This provides conveniences to customers since not all the customer are able to take time to visit the physical stores. Even the customer with hectic lifestyles and packed working schedule can have a chance to purchase the products that are sold in physical store through Amazon.com. Due to this, the customers feel that Amazon.com has created an opportunity for them to spend some enjoyable and relaxation time on shopping after a hard day work. Sometimes some products sell in Amazon.com are not sold in traditional bookstore. So, the customer can purchase the product in different places and this makes the customer feel enlightened because they need not to be physically present and yet they can get the products they wanted through Amazon. Since it is a traditional bookstore, the customer needs to be physically present at the store. In order to be physically present, the customer needs to drive, walk or even take public transportation to the physical location of the bookstore. Furthermore, the customer needs to find parking to park his car and spend money to pay for the parking fee. And definitely time is an important consideration. However, being physically present at the physical store will provide customer with an entire different experience that a customer might not be able to experience it through online. For example, the customer can meet other customers, see their face expression and gestures and can have face to face interaction at the physical facility. However, if the customer is from the working class, location will be a problem. Especially the one with busy schedules and life, they could not afford to drive and visit the physical store every time they wanted to purchase books. This will be time consuming and tedious process. Since Amazon is an online company, the customer need to access to internet in order to visit the store. The activities will only involve the interaction between the customer and his computer. There will be no contact personnel physically present to serve the customer compared to traditional bookstores. So the contact personnel’s mood and action will not influence the customer. The customer will message his inquiry through email and wait for the contact personnel to reply, so there is no face to face interaction takes place. Even the payment of the products in Amazon.com will be paid by credit card. Then the receipt will be saved and printed out as a proof of purchase. But this is not what exactly happened if the called the customer representative through the number provided in the website. The customer representative can still influence the customer’s shopping experience through her tone of voice, personality and words. If the customer representative can answer the call within a few seconds of rings and help the customer with the problem, then the customer will have a satisfying experience. However, if the customer representative has held the call for too long, being impatient and rude to customer and cannot make decision to solve the problem, the customer might feel even more annoyed and irritated. Customer is physically present at the store. So, there will be contact personnel present to provide assistance to the customer. Due to this, the customer can actually be affected by the contact personnel’s gestures, attitude, actions and words when they interact with each other. The shopping experience is good if the contact personnel demonstrate a good attitude, friendly, helpful, nice and polite attitude. For example, when the customer asks for help to search for certain books; the contact personnel will try to find the book even though she might need to try a few attempts before she can get the correct book. Her actions show to the customer that she is willing to serve the customer with patience. The customer will feel appreciated and respected. However, if the contact personnel are not in a good mood, having a bad day and cannot control his own temper and face expressions, then the customer will be the one who will actually get from them. For example, if the contact personnel is feeling angry and there is a few children running around the store, he might scold the children harshly which will makes the parent (customer in the store) feel bad and might leave just leave the store unhappily and feeling being embarrassed by the contact personnel. Furthermore, since the employee is usually student who works as a part timer, he might not received any training or even know about all the books and merchandise (situated in which shelves or availability). Then he may be cannot provide accurate answer and waste time to search for the customer’s books. This will makes the customer feel impatient and angry since they need to wait. As a result, they might just leave the bookstore empty handed. The interaction of the customer and employee will be conducted through online. Eventually, if the customer has any inquiry about the products or services by Amazon, the customer need to email the employee and the employee will reply the customer back. Since it is through email, the customer cannot expect that he will get immediate response or answer from the employee. Even though how effective is the employee, she cannot immediately reply the email a second after the customer sends the email. So instant responses is out of the question in Amazon.com. The employee can reply on the same day but definitely not instantly after customer send the email to her. So the customer might need to wait for the employee’s reply before he can continue his transaction in Amazon.com. This means that he might need to spend time, revisit the website again to continue the transaction and cannot do the transaction in just one visit. But if the customer is asking through the online chat provided by Amazon, then the contact personnel can reply immediately. There is face to face interaction between the customer and contact personnel. So whenever the customer has any inquiry, he can directly ask the employee in the store for clarification and assistance. The employee will give instant and immediate response to the customer. If the customer wanted to search for any books or magazines in the store, the employee can even help them to search the book and pass it to them if the book is available in the store. The customer need not to wait for a few hours or even 1 working day in order for the employee to reply compared to Amazon.com. The transaction can be done in one day and the customer no need to revisit the store again for the answer of the questions that he asked to the contact employee, provided that the question is not involving critical management decision. Customer need not to wait in order to complete a transaction or while exploring Amazon.com. This is because it only involves the interaction between the customer and the computer. If there is any question or problem regarding the shipping or product information, the customer can choose to email, ask contact personnel through online chat or call the customer service representative. Customer need not to queue in order to make payment as the payment is by credit card. But customer might need to wait for quite a while if he is calling the customer service representative or waiting for the employee to reply his email. If there is a huge crowd in the store, the customer might need to wait for quite long in order to pay for the products. Furthermore, he needs to wait until the employee solves all the customer’s problems that are ahead of him. (At least need to wait for employee to answer questions, search for books or find certain products in the store). But if there are few shoppers in the store, the customer will receive feedback and help wi-thout the need to wait for a long time. Amazon.com is an online website. Eventually, the customer can choose to visit the website anytime they desire and free to do so. The customer has complete freedom to decide when they want to visit the website. (Even after all the traditional bookstores have closed!). The graphics and design of the website is designed with customers in mind to ensure that it provides a good and user friendly website to the customers. This can actually reduce the effort and time that customer need to spend on exploring the website. Furthermore, the customer can take their own time to browse or explore the website since the website will not close. The customer can actually spend their time in the Discussion Board Service and chat with other readers or even authors of the books. Features such as personalized webpage, personalized recommendations, personal wish list and ‘good memory’ shopping cart creates added value to the customers and give them a sense of belonging because the features provided are all personalized to each and every customer. Amazon’s website also provides answer in step by step procedures to the common problems that customer might face when they are purchasing through Aamzon.com. This is great approach since the customers will be exactly clear what they should do and they can solve their problem immediately. There will also be no pressure to purchase any products and the customer can reconsider a few times whether he wanted to purchase the product or not. He can return to Amazon.com once he has made his mind to purchase the product. But the customer needs to wait for the products to be shipped to the required location. The days that Amazon used to ship the products depends on the location of the customer and whether there is any obstacles along the shipping process. The process of getting the physical product is getting worse if the product is defected or not in a good condition when it reaches the customer. The customer needs to ship the product to Amazon again and wait for Amazon to ship back the replacement product. Furthermore, if a customer does not visit Amazon for a certain period of time, Amazon will send an email as reminder with books recommendations to encourage the customer to visit Amazon. Traditional store has its own working hour. The customer cannot visit the store anytime they are free. There is a time limitation. Usually the operating hours is from 10 am to 10pm. Customer who wants to visit the physical store must follow the time that has been fixed as the open hour. The design in the bookstore gives more ‘homely’ feel to the customer so that the customer will feel comfortable exploring the bookstore. In traditional bookstore, the customer can spend how many hours they like reading or even choosing their products. There will be no contact personnel staring at them while they are reading to pressurize them to buy the product. They have complete freedom what time they wanted to come and when they want to leave, as long as it is within working hours. Furthermore, the customer can spend their time to involve in social interactions with other customers while listening to the music. However the customers who have busy schedules cannot afford to visit the physical store. It will be a limitation for them to visit within certain hours since they cannot really control their working hours. There will be no shipping time involves because the product can be directly purchased from the store and as soon as the customer make their payment, and can take the product back home. If the customer wanted to return back the item that is not in good shaped, he can visit the shop that he bought the item from and exchange it with a new one within a week from the date of purchase. Unlike purchasing through Amazon.com, customer no needs to spend so much time in waiting for the replacement of a new product. Some traditional stores will even provide membership card to the customer. Each time the customer purchased any item from the store, points will be accumulated and customer can exchange gifts with the points. This is to ensure that the customer will continue to purchase from the store and retain as the bookstore’s customer. Assume that a customer wanted to purchase a book from the website. Initially, he will type the website name which is Amazon.com and a few seconds later, the homepage of Amazon.com will appear on the screen. The customer can log in and directly go into the Discussion Board Service to chat with other users about the books that are in interest and ask for their opinion regarding certain books. If the customer is lucky, he can even chat with the authors personally. After gathering all the information, the customer can choose to type the name of book that he wanted or select the book categories and search from given list. After he reaches the book’s category, he will need to choose which book that he wanted and put it in a cart. There will be other books recommended by Amazon which states ‘better together’ so that the customer will purchase both the book he wanted plus the recommended book with discounted price and there will be also suggestion of “the customers who bought this item also bought” in order to help the customers to search their favourite type of books easier. He can read through the shipping and return policy to make sure that he understands the terms and conditions. If he has any questions, he can email the customer service representative or call the help centre. Then he can proceed to the payment by credit card and confirm the transaction. Finally, he needs to keep or print out the receipt as the proof of purchase. If the customer wants to check where is the location of the product after he purchased the product through Amazon, he can click the link at the bottom of the home page which is the “Where’s my stuff” and the customer can track his recent order. After a certain period if the customer do not purchase anything or revisit the website, Amazon will send a reminder to the customers to remind them to visit Amazon.com. First, the customer must be physically present at the MPH bookstore. When he first reaches the bookstore, he can have a look at the best sellers’ books on the reserved shelves near the entrance. If he already has a list of books in hand, he can directly ask the customer service representative that is available to help to search for the books. After he decides on which books to buy, he can proceed to the counter and pay for the items with cash or credit card. If the customer has the bookstore’s member card, then there will be on the spot discount and points can be collected upon purchase. The points collected can be exchanged for gifts. Receipt will be given to the customer by the cashier as a proof of purchase. Furthermore, every month, there will be newsletter send to the customer’s home to inform the customers the latest promotional activities, new books and items and attach along with the coupons so that customers can purchase certain items with lower prices than usual. Amazon not only limited to selling books but also a lot of other product categories such as apparel, automotive, baby, beauty, cell phone & services, electronic, gourmet food, grocery, health & personal care, Home and garden, Home improvement, Industrial and scientific, jewellery, kindle stores, movies, magazines, MP3 downloads, music and musical instruments. Anything that a customer can name it, Amazon has it in their website. With variety of products available, Amazon provides customer with wide selection of choices and comparison of prices and give customer a chance to search for the best deals. With only just a few clicks, all that a customer wanted to buy can be delivered straight to the customer’s location. This feature not only provides customer with convenience but also higher bargaining power and the customer can get the best value with the minimum price paid. Amazon ensures the customer get the best and receives superior value which results in customer trust and repetition of visits to the website. But the disadvantage of having too many choices is that the customer might end up leaving the website without buying anything because the choices are too wide and the customer do not know what he should purchase. For traditional store, the merchandise or books provided to the customers are limited. This is because in order to have variety of products offer to customers, the bookstore needs to have large space to accommodate the stocks and solid financial back up to pay for the inventory cost. So, the bookstore actually offers limited product categories and depth of merchandise. Due to this, there are many products not readily available to customers when they wanted the products. The bookstore will only stock up those merchandise or books that are popular and can be sold out fast since the owner need to make sure that their inventory turnover to be high. Unlike Amazon, some of the books that are less popular will not be available for customer. The choices provided to customers are limited. But there is also advantage to traditional bookstore. Since there are not many options available, the customer can decide what they want to buy without too many hesitations. In Amazon’s website, only ‘sight’ sense is involved. This is because the customer only looks at the computer screen in the whole purchasing process. Customer will be exposed to words and graphics in the website. Due to this, the website tend to have comforting background colours (white) and font that is big enough so that the customer need not to strain his eye and can clearly read each and every words in the website. Even the type of font used is the common one. Amazon tries to reduce customer searching effort and time by categorizing all the categories systematically so that it will be easy to search for merchandise. In order to purchase through Amazon, what customer really needs is to look at each and every link and search for the products in the website. But the disadvantage is that customer may feel tired after being exposed to computer’s glare for too long. And the customer only can view the product’s graphic but cannot utilise his ‘touch’ senses and feel the product with his own hand. In traditional store, there are only three senses involve which are sight, sound and touch. Since customer is physically present at the store, he can actually utilise his sights to observe the surrounding environment. For example, the lighting (damp or bright), the floor, ceiling and counter’s condition, employee appearance, whether the book is still new or dusty, whether the store is dirty or not, employee’s gestures, facial expressions and actions and other customers behaviours. All these observations will contribute the customer’s perception towards the bookstore. Customer also utilises his ‘hear’ sense when he listened to the soft music in the background and engage with social interactions with others or accidentally eavesdrop other people’s conversation. Finally, customer utilises his ‘touch’ sense when he take a book and flip through the pages or take other merchandise and examine its conditions (Whether it is still new or defected). Amazon actually designed an experience that is easy to learn and use for the customer. Amazon included all the answers for the common problems that customer might face in the website. For example, how to register and become a member, what is a wish list and how to use it, how to engage in discussion, and even a very detail and complete list of return policy and shipping conditions. These entire information acts as guidance to the new customer or customer who do not know how to use certain links. The information is provided in terms of step by step process so that customer can follow the step exactly. But the disadvantage of Amazon’s website is that it is much cluttered with information which might confuse the new user since they are not familiar with the searching and gathering information process. Through Amazon, customer can learn how to go through the online purchasing processes. Customer need to explore and search for the products without the physical presence of shop assistant. From the beginning until the end of the process, customer will engage in DIY concept (Do it yourself). Customer also need to read the terms and conditions applied. For example, the shipping and return policies. This will train the customer to be more careful and attentive about all the information given in the website. Finally, the features provided by Amazon such as the shopping cart and ‘wish list’ provide customer freedom to make their own choice of list without the help of others. The customer can also learn about certain topics or books and give the customer an opportunity to present their idea or share opinions through the forum and discussion with other customers and contact personnel which will give them a better idea of the merchandise. In traditional bookstore, all the shelves all labelled with product categories so that the customer can easily search for the items. There is also computer provided so that the customer can search for the item’s availability without the help of the shop assistant. The computer is easy to use since the customer only needs to type in the book’s title or author’s name and the specific information such as book’s location, quantity available and price will appear on the screen. This actually provides an opportunity for the customer to learn how to fully utilise the equipment provided. Even though there is computer provided to aid the customer, there is also a personal assistant physically present to help the customer if the customer does not know how to use the computer, read the labels on the shelves or fail to find certain books. The customer can actually be trained to look and search through the shelves in the bookstore. In Amazon, customer has his freedom to choose whether what time they wanted to go online and what time they want to log out. Some customers who have hectic schedules might choose to online at night after finishing all their tasks but some customers prefer to online in the morning or afternoon. The customer even can choose to online everywhere they like as long as there is internet accessibility. Thus, Amazon provides this flexibility to customers to have their own choice of location and time. Amazon also provides a discussion forum to the customers. Customer who likes to voice out their opinion can feel free to speak out and those customer who just like to read other people reviews can do so because Amazon do not force customer to leave a review but only encourage customers to do it. Customer can choose whether he wanted to purchase right away after viewing the product or return back to the website to purchase after consideration. There is no rush in doing anything in Amazon. Customers can do whatever they like if they think is appropriate. Then, customer can choose where they wanted to ship their products. Whenever the customer feels that he likes something, he can put it in his shopping cart, but if soon he realised he does not need it, he can takes it out. The same concept applies to the personal “Wish List’. In traditional shop, customer can feel free to explore the shop and flip through or even read the books. The duration of time they wanted to spend in the store is not fixed as long as it is within working hours. The customer can spend a few minutes and leave or spend a few hours just to read the books. If the customer wanted to search certain items, he can choose to check it through computer provided or directly ask the shop assistant. This is because some customers do not like to search themselves and they prefer to ask the assistant to get an immediate answer. They tend to believe in human interface rather than machine interface efficiency. Customer can even sit in the chairs provided and listen to the music or chit chat with others than just read books. The customer can choose not to buy anything in the store if he does not need anything nor has no specific wants. Finally, the customer can choose the type of payment method. They can pay with credit card or cash. This actually provides flexibility to customers who do not like to bring too much cash along with them. Ins short, customer can choose to do whatever they want to maximize their shopping experience in the store as long as it is appropriate. In Amazon, it encourages active customer participation. Customers are absorbed and immerse into the whole searching and purchasing process in the website. Customers are absorbed in the process when they engaged themselves in the discussion with other customers and the contact personnel in the Discussion Board. Then, the customers immersed themselves into the process when they join in the chat room and chat online with other customers, contact provider or the writers. In short, purchasing through Amazon can actually provide customers with escapist and educational experiences. Furthermore, Amazon tries to make customer involve in the virtual community by giving them a sense of belonging. For example, there is personalized website for each customer who has registered in the website and provide personalize recommendations to individual customer. Besides, the customer is encouraged to post his reviews or give personal advice on the books or other merchandise, free to exchange information and opinions on how to develop Amazon’s website for future use. This gives an opportunity for the customer to speak up through the forum. There is also a “Wish List’ provided so that customer can actually put the books or merchandise that he likes in the list. This actually provides customer with free and own personal space so that the customer can put whatever he likes in the ‘Wish List’. And other customers who wanted to give gift to the customer can actually view the receiver’s wish list to buy the appropriate gift. In order to increase the website’s loading speed, Amazon avoid using large graphics. Amazon also has powerful search engine which can recognise misspellings. The products are systematically arranged according to categories and links are clearly provided in Amazon.com. This will reduce the effort and time for customers to search for the products. The shopping cart provided by Amazon has a ‘good memory’. This is because all the items that the customer puts in the cart will remain even after 4 months the customer last visited Amazon. This will help the customer to group all the items together and purchase in one time which provides convenience to customer. On the other hand, the information provided by Amazon regarding the common problem (Example, return policy, shipping cost, how to engage in discussion and other features) is well presented and clearly written step by step. Finally, if the customer does not visit Amazon for certain period of time, Amazon will take initiative to send a reminder through email to the customer to remind them to visit and provide book recommendations. In traditional bookstore, customer is physically present in the bookstore. Customers are engaged in passive participation and immerse themselves in the whole process if they just go into the bookstore and buy something without having too many social interactions with others. But customers will engage themselves actively and immerse themselves if they exchange information with one another in the bookstore. Customers will be there to search for books and engage in social interaction with other customers. In order to increase the esthetic experience, some traditional bookstore is designed to give the customer a feeling of extensive living room so that the customer will feel relaxed and fully enjoy his shopping experience. Furthermore, the customer needs to walk through the shelves in order to find something that interest him. Customer will feel more satisfied with his purchase since he puts some effort and time to search for the product. Even it might be a bit tiring to search through the shelves but it is one type of customer’s effort in order to be physically present in the bookstore. There will be soft music playing in the background, warm and bright light, warm wall colours and clean surrounding to optimize the reading environment. Furthermore, the customer can chat with other customers or even the employee regarding the latest books, topics or feedback from the books. From the discussion, customer will learn something or at least have a better idea of what book he should purchase. There will be computer provided so that customer can search for his book without the help of shop assistant. Besides, there will be a shop assistant physically present at the store to provide assistant to the customer so that the customer can find someone to help with his problem when he needs it. Some traditional bookstore even provide membership card in order to retain the customers. And points will be accumulated for gifts exchange. This is a good approach to ensure that the customer will come back for repeat purchase. One of the common advantages of shopping online is convenience. The same applies to customers who go shopping at Amazon.com. Since Amazon.com is a virtual organisation, it will not close its store. This means that it is 24/7 available to the customers. Due to this, Amazon.com offers a great flexibility in time for the customers to browse the information and products in the Amazon.com website. This is especially true for the customers who are working and hard to find time to visit the traditional bookstore. Furthermore, as long as there is internet access, the customers can choose to view the Amazon’s website anywhere they are. Location or time is no longer a boundary to the customers who have hectic lifestyles and packed working schedule. Customers can have their own sweet time to browse through and explore Amazon’s website. This is because there will be no contact personnel present and give unwanted pressure to the customers. Even after the customers viewed through the products in Amazon.com, customers can choose not to buy first and return back to the website later. Customers can take their time to make consideration whether they wanted to purchase the product or not. This is also why there is increasing number of consumers who are purchasing through Amazon.com. Most of the consumers enjoy the process of searching and exploring Amazon.com without time pressure and limitation. Most of the time, the experience can be affected by the contact personnel that present in the physical bookstore. Customer’s emotion and mood can actually be negatively affected or positively affected by the contact personnel. In Amazon.com, there will be no contact personnel present. So, there will be no face to face interaction. Since there is no face to face interaction, the customers will not have to face the contact personnel’s attitude. The most is that the contact personnel will be chatting online with the customer if the customer has any inquiry about products listed in Amazon.com. So, the contact personnel’s attitude does not have a chance to influence the customer’s experience. One of the most impressive things about website is that it can accommodate variety types of products more than traditional bookstore. In this case, Amazon.com actually divided its products into many categories. Some of the categories are apparel, Automotive, baby, beauty, book, cell phone, electronic, gourmet food, grocery, health and personal care, home and garden, home improvement, industrial and scientific, jewellery, kindle store, magazine, movies and TV, Mp3 download, music and musical instrument. These are just the categories without going into details about each product in each category. This is definitely one of the most impressive feature that traditional bookstore cannot afford to offer. Due to this, customers can click on the categories of products that they would like to browse through easily. This will help customers to ease their search and save them a lot of time compared to going to a few traditional stores. With wide variety of products, customers will have broader choice in choosing the products that they wanted and get the best deals. The customers will only be interacting with Amazon’s website. So, whatever the customers wanted to search or buy, it will only be involving the customer themselves and the website. Customers will even pay for the product with credit card which involves online payment. Since there will be no other customers physically present, the customers who shop online in Amazon.com no need to queue in order to make payment. If the customer has any inquiry, they no need to wait until the contact personnel are free to serve them but they can just email the contact personnel and wait for the employee to reply through internet. There is also no need for customers to ask the personnel about the location of the products because all the products have been categorized according to the types of products. For example, under the book category, there are books, kindle, textbooks, magazines and newspaper. So, online shopping at Amazon.com reduces a lot of waiting time since there are no other customers in the waiting line and no need to wait for contact personnel’s assistant. In Amazon’s website, all the products have been categorized according to the types of products. The customer only need to click on the categories and all the products in the category will appear on the screen. Furthermore, if the customer is searching for products other than the categories provided, customer can click ‘everything else’ inside the search category and all the other products other than the products that have been grouped will be listed out along with the picture of the product’s model. He can also type the product that he wanted to search then choose the category that the product is in if he knows exactly what he wanted to buy. So, the products are actually very easy to be searched in Amazon.com. Besides, once there are new books or magazines and even Amazon’s best seller, the information will appear on the first page of Amazon’s website. The first page of the website (The homepage), will also show the discount provided for certain books or magazines to alert the customers of the promotional deals without having the need of customers to search which books, magazines or even products is having special price. It is not deniable that online shopping indeed provides convenience and there will be no other customers around that will affect the customer shopping experience. Usually, online shopping will be done at home. This means that the shopping experience will only involve the customer himself and the computer. There will be no other customers to be around, interacting with each other and play a part in contributing to customer’s experience. Furthermore, there will be no contact personnel to provide assistant face to face to the customer to answer his inquiry. There will be less sensory stimulated because the customer cannot touch and feel the book. What the customers can do in the traditional retail bookstore cannot be experienced through online. This is what makes all the difference. Sometimes it is just because of the feeling of being physically present that matters the most. Since the online shopping only involves the customer himself and the computer, there will be less sensory stimulated. This is because the customer only can see how the website is designed and the colours used but the customer cannot actually physically touch and feel the book or other products such as stationeries. When it is related to physical product, customer tends to enjoy the process of searching and touching the book. Furthermore, the customer is not physically present to look at the environment, the colours of their wall, the book shelves, the counter’s condition, the employee’s appearance, sit on the sofas provided or even interact with other customers. All these are actually physical evidence that contributes to part of the customer’s experience. But because of online shopping, the customer will missed out all these physical evidence (tangible or intangible) and all those things that will actually stimulate and satisfied the customer’s senses. In Amazon.com, there will be no face to face interaction between the customer and the contact personnel. All the interactions or transactions will be done online and there will be no personal contact. Initially the customer will click on the category of products that he wanted to search. Then, he will choose the product that he wants and purchase it. If the customer has questions, he will post the questions in the Amazon’s website and wait for the contact personnel to reply through the email or specified link. If the customer has no problem with the transaction, the customer will make payment by credit card. Then a confirmation email will be in digital form which the customer can print it out if he wanted to. From the start until the end of the transaction, there will be no contact personnel having face to face interaction with the customer. All the activities involve are only being conducted through online. Since all the interactions and transactions will be done online, then the customer cannot expect that the email will be replied after 1 minute it has been sent out. At least, the customer should give the contact personnel one day for reply. Online shopping is different from being physically present in a traditional bookstore. In traditional bookstore, the contact personnel will have face to face interaction with the customer. So, the contact personnel can give immediate feedback or responses to the customer’s inquiry or even readily available to provide information regarding the services or products by the firm. Since online shopping at Amazon.com does not involve face to face interaction, then the responses given by the personnel might not be immediate. But, if the customer is chatting online with the contact personnel, then the customer will receive immediate responses. It is undeniable that maybe some of the books, magazines, stationeries or other products that are being sold in Amazon.com might offer lower prices compared to traditional bookstore. But, the location to where the product which it is going to be delivered will determine whether the customer save his money or spend more. If the book is going to be shipped to Malaysia, the product plus the shipping cost will definitely will be higher than purchasing through online bookstore (Do not forget about the currency exchange rates). But if the customer stays in the States, then there will be free shipping after the customer spends more than $ 25 in Amazon.com, but this also depends on what type and how much is the weight of the product. So if the customer is staying far away from the States, then he will probably need to bear more shipping cost which might lead to higher price to purchase through Amazon.com compared to traditional bookstore. Since Amazon.com is operating online only, all the products that customers purchased are through online. After the customer chose the products that he wanted and paid for it with credit card, Amazon will ship the products to the customer’s location. So, same applied to the customers. If after customer received the product and realized the product is not the appropriate or in bad condition, the customer need to ship back the product to Amazon. This will be very time consuming. Then the customer needs to wait for Amazon to ship back the product again. Traditional bookstore provides servicescape and all those physical products that will create part of experience to the customers especially the “touch’ sense. The lighting and the layout of the store will also provide comfort to the customers. Usually the traditional book store uses bright light in order to make the customers feel comfortable reading in the bookstore area so that they need not the strain their eyes to catch each word written in the books, articles or even magazines. The bookstore is equipped with few comfortable chairs and sofas so that that the customers can relax themselves and ‘feel’ that as if they are sitting and reading in their own extensive living room. Furthermore, the way that the books, magazines and other products are arranged encourages customers to ‘touch’ the products. Customer can even flip through the pages and read through the book before deciding whether he wanted to purchase the book or not. Furthermore, customer can use his ‘sight’ to look at the book store’s environment such as layout, contact personnel’s appearance, the books and merchandise’s conditions and other customers’ actions and gestures. Since there is soft music in the background, the customer can utilise his ‘hear’ senses to slowly build up his mood and relax himself to enjoy the time he spend in the bookstore. In the traditional bookstore, the customer can actually meet up a lot of new friends whom has similar interests or hobbies. The customers that are physically present in the traditional bookstore basically consist of two types. The first type of customer is the one who goes in and grab a book, magazine, newspaper or other products sold in the store and just stay there for maybe half an hour. The other type is customer who stays for a few couple of hours or even the whole day reading the books in the bookstore. Customer can actually socialise with the type of customers who stay in the bookstore for a long duration. It is not unusual that both customers might have the same interest on specific topic or books. Furthermore, contact personnel will also be physically present to provide guidance and information. So, the customer can actually ask the contact personnel’s questions or chat with her regarding the latest books or magazines that are on sale and ask for her opinion on certain books. The customer can actually gained a lot of information of the products in the store through the conversation with the contact personnel. In traditional bookstore, the customer will be physically present at the store. There will also be contact personnel present to provide assistance to the customers. Due to this, whenever the customers have any questions or need assistance in searching for certain books, magazines or other products, they can directly ask the contact personnel for help. Since it involves face to face interaction, the customer will get immediate feedback from the contact personnel in the store. Customer need not to wait until a few hours or the next day to get an answer unless the inquiry cannot be answered immediately and involves critical management decision. For most consumers, retail shopping is an enjoyable activity. This is especially true when the individual customer is accompanied by her family members or even friends. Actually the same applies to traditional bookstore shopping experience. However, even if the customer is alone, she will enjoy searching and exploring the bookstore. She can browse and flips through the books or even magazine pages. The customer senses will be stimulated and she will enjoy the feeling of being physically present. Furthermore, she can get to know more new friends in the physical bookstore. This can be a very important element which contributes to customer shopping experience. Not all experience is expected to be life altering. Good experience can be also being created through surroundings, the physical environment and the people around the customers. Furthermore, customer can spend her leisure time reading different types of books without limitations. This is also a kind of relaxation that customers can get in bookstore. If the customer feels that she needed a break, she can actually sit on the chairs provided by the bookstore and enjoy the soft music in the background. So, shopping in traditional bookstore can also be a source of entertainment. Since there is a physical location of book store, then the customer can easily return their products if they found out that the product is not working well or defected. The only requirement is that they bring along the products that they bought from the bookstore with the receipt as a proof of purchase (within 3 to 7 days from the date of purchase). There will be no extra cost incurred in this return. Customers can either get a new product as replacement or refund the amount of money that the customer has paid for the product. The process is very simple and the customer can receive immediate action from the contact personnel. When there is physical store involved, waiting time is one of the components that are not unusual to happen. The situation is worse if there are too many customers in the store at the same time. This usually happen during weekends. There will be many customers in the bookstore searching for their books, newspaper or even magazines. Since there is a huge crowd, the contact personnel cannot manage to handle too many questions from too many customers at once. So, each of the customer eventually need to wait to be served. Furthermore, the queue at the cashier will be long since there is a huge crowd and most customers are rushing to get their products paid and leave the bookstore. For large traditional bookstore, the situation may be a bit better since there are more employees on duty and cashier counters. But for the small traditional bookstore, this might really test the customer’s patient and this might make the customer feel annoyed and dissatisfied with the service provided. Since it is a traditional bookstore, there will be other customers present in the store and not just an individual customer. Due to this, other customer’s action or behaviour will affect individual customer’s shopping experience. For example, if customer A is talking with his friends and customer B is reading books near customer A, B will feel distracted by the whispering sounds and their laughters. So, B will feel annoyed and cannot concentrate on reading and might leave the book store with a bad mood. The second example will be the queuing time. Each customer will have an impact to the queuing time. The more customers in the line, the longer the customer needs to wait. If the waiting time is too long, the customer will feel impatient and might just leave with unsatisfied feelings without purchasing anything from the store. Even the information provided by the employee will be littler since there are too many customers waiting to be served. The employee cannot serve too many customers at a time, so in order to reduce the customer’s waiting time, he will tend to give brief answer and spend less time in providing assistance to each customer. As a result, the customer might have a negative feeling of not being appreciated by the service provider as a customer. The customer needs to be physically present at the traditional store in order to make purchases. Due to this, the customer needs to spend time to travel to the physical location of the store. This is an issue for the customers who are working and have a pack working schedule. They might not have so much time to travel to the bookstore and search for the books or products. Furthermore, there is a fixed working hour for the bookstore. The customer can only visit the bookstore during working hours. The customer cannot choose to go and visit the store whenever they like. They need to adjust their time according to the working hour of the bookstore if they wanted to visit the bookstore. Contact personnel will be physically present in the traditional bookstore. The contact personnel can be the one who will help the customers with their inquiries and provide them with satisfying experiences. But the contact personnel can also be the one that greatly affects the customer’s shopping experience. Well, employee is also a human being. He will have his mood swing and emotionally unstable at some time. If the personnel cannot control his emotion and mood, the customer can feel it through his expressions, actions and words. For example, an employee in a store is having a bad day. Then, out of sudden a fussy customer approached the personnel and asked a lot of questions which irritates the personnel. Then the personnel will react rudely and answer impatiently to the customer. The customer will feel angry and think that the bookstore’s management do not know how to train their employees and the bookstore’s management is a ‘rude’ management. Finally, this will results in a negative shopping experience to the customer since she feels that she is not being respected and appreciated as a customer. So, the way a contact employee treats a customer will affect the customer’s shopping experience. Discuss the role of technology in the customer encounter with Amazon.com. Can an Internet service encounter such as Amazon.com be a memorable experience? How? Discuss the role of technology in the customer encounter with Amazon.com. Amazon.com is the global leader in e-commerce since Jeff Bezos started Amazon.com in 1995 at Seattle, Washington. Bezos and his management team spent one year in creating Amazon.com which is based on technology-generated service encounter and technology-mediated service encounter in the customer encounter. According to Fitzsimmons,J.A., & Fitzsimmons, M.J. (2006), the technology-generated service encounter is whereby the human service provider is replaced entirely with technology that allows the customers to operate by themselves. It is becoming more common as firms attempt to reduce the cost of providing service. Amazon.com is the first online bookstore which uses this technology to operate its business and its sales started to grow tremendously. By using this technology, Amazon.com had replaced the traditional bookstore and provides other benefits that a traditional bookstore cannot provide, for example, discussion board service, simple storage system, personalized recommendations, author’s corner, online reading group, and so on. Amazon.com used this technology to provide convenience, time saving, and make it easy to use and understand. Amazon.com also used this technology to personalize the customer experience without using human interface. Besides, not only human dominant interface can create memorable experience to customers, machine dominant interface, such as website which is used by Amazon.com, can create memorable experience to customers too. Moreover, this technology also helps Amazon.com to serve their customers better and create loyal customers who not only visit the website, but also interact with it. Amazon.com also based on technology-mediated service encounter in the customer encounter, which the customer and human service provider are not physically together and thus the service encounter no longer is the traditional face-to-face contact. Amazon.com interact with customers through Internet to deal with its customers, for example, send news updates to customers through e-mail, customer request through e-mail and hotline, and so on. By using this technology, Amazon.com able to respond to customers’ needs and wants without letting customers to wait for a long time. With the advancement of the technology, technology-generated service encounter will be widely use by many other industries and use it to solve their solutions. For example, Amazon set a goal, as stated in the case, which is to be a one-stop shopping site on Internet in future. Can an Internet service encounter such as Amazon.com be a memorable experience? How? We agree that an internet service encounter like Amazon.com can create memorable experience to all users. There are many ways for Amazon.com to create memorable experience to all users such as discussion board service, personalize web-page, and many more. Using seven design elements of the customer interface approach would be the best way to show how Amazon.com can be a memorable experience to customers. Seven design elements of customer inter face consist of context, content, community, customization, communication, connection, and commerce, which will be explained in the following table. Display pictures are designed to put at the middle of the page which will capture users and visitors attention. Medium, colorful, and attractive display pictures are able to stimulate customers’ eye sight and they can remember for quite the long time. These display pictures are designed to put at the center of the webpage to attract customers or visitors to stay longer at the particular website. Besides, customers can also have memorable experience when they see display pictures of items which relate to their personal preference. Amazon.com will greet every member when they sign in or log out. For example, before customer want to sign in, there is a ‘hello’ beside the sign in button. After a customer has signed in, the word ‘Welcome, Mr……’ will greet the customer. After a customer log out the webpage, greeting like ‘Have a nice day’ will appear to wish him. Design different theme based on different category of product can actually create memorable experience if they visit the website repeatedly. Design different music background can also become a memorable experience to customers because music can influence ones mood or emotion that will make him recall those happy and sad moments from the past. Text, pictures, sound, and video that the website contains. This service allows customers to store information on the company’s secure server. Amazon storage service has unlimited storage which allows customers to have the opportunity to stash their multimedia files. By doing so, customers are able to open and retrieve their files anywhere anytime as long as there is a laptop and internet available. Amazon offers this service for users to access to their product data and historical pricing from the last three years. Unlike the traditional bookstore, customers need to walk around to ask and compare the prices by themselves. This service can provide customers one of the kind experiences that other websites do not provide this service. A customer may search and choose his favorite songs at Amazon and download it instantly for free. Customers may also play the music instantly using Amazon media player while surfing Amazon website. This service can attract customer to stay longer at the website. The way that the site enables user-to-user communication. This service presents an opportunity to read comments from readers about books of interest to the customer and chat with other participants. This service allows customers to interact virtually with each other and also can start a new virtual friendship or relationship with each other. Author corner allows customers have the opportunity to engage in question-and–answer sessions with their favorite writers through Amazon. With this service, customers can have wonderful experience with their favorite author by ask questions and get the answers from their favorite writers. A customer can enter titles of books he would like to have in a personal wish list. Then his friends or family members may choose any item from the list to give him as a gift. This user-to-user interaction is unique which other book store are unable to provide. Amazon allows visitors and customer to post reviews of any book on the site. This review posting involves customers in developing the content on the Web site, and also creates an information tool for other visitors and share the reading experience with them. Site’s ability to tailor itself to different user or to allow users to personalize the site. A customer can customize his own card and give it to the love one as a gift. This service can create wonderful experiences to customers as they can design their own cards for their family, friends, or love ones. Amazon develops a list of proposed titles for its customer to read based on the customer’s past purchase. Besides, Amazon also provides the same friendly and personalized reading advice that a local bricks-and-mortar bookstore operation can. A personalized Web page that greets the customer by name when a repeat customer log on to the website. Customers will feel warm and want to visit the website again and again. Wish list can also classify under customization because customers who develop the wish list may customize the list himself. This is also one of the memorable experiences because customers get to involve in developing the list through Amazon.com to let other people know his wishes. The ways the site enables site-to-user or two-way communication. This feature connects Amazon customers with customer service representative. By clicking the AmazonLive button will results in two options, which are connection by phone or connection by live text chat. This service will help customers to solve their problems and fulfill their needs and wants which giving them a unique experience. Amazon has this service to satisfy its customers. Amazon.com employees try their best to complete their customers’ requests. For example which is stated in the case, a customer reported with joy that a copy of his father’s book, 20 years out print, had been located by Amazon. From this example, Amazon.com has provided him a memorable experience. Degree that site is linked to other site. Amazon members are able to link to other website through Amazon.com without having any extra charge because Amazon.com provides many links to other websites but only for members. Site’s capabilities to enable commercial transactions. This service allows customers to watch video online straight away after purchase. Customers are able to enjoy the video without waiting for the video delivery. Customers can have their fun-time through Internet and this will give customer a memorable experience. Use Amazon’s e-Commerce service to set up an online store is another kind of experience that customers can have. For those customers who like to do small business but do not have enough modal to open a store can consider Amazon as one of the best options. Customers who open an online store will definitely have memorable experience when they successfully sell their first product through Amazon.com. Will Amazon.com continue to be successful against “click-and-mortar” competitors, such as Barnes and Noble, who go online? Justify. To better understand the situation and position of amazon.com, Amazon has to evaluate its and its competitors’ (Barnes and Nobles, MPH Bookstore, etc.) strength and weaknesses. Founder Jeff Bezos started the company as an online company. Leveraging the advancement of internet, Amazon able to serve its customers, without restricted geographically. The company grew steadily in the early 1990s and able to survived the Internet “bubble burst” at the mid ‘90s. This was due to the product diversification and it international presence. Amazon is not merely a virtual book store; it is an online community where consumers can create online product reviews. Therefore it provides opportunities for consumers to do a quick research on a product before purchasing them. These thirteen years of establishment has built a large community of online users which will help to retain its position over other online retailers. Besides that, due to the nature of Amazon’s business, Amazon able to provide products at lower price; minimum human resource needed, no physical shops maintenance. According to Survuction Model, develop by Eiglier and Langeard, the presence of other customers affect another customer’s service experience. Amazon.com provides a discussion forum where users can seek more information about the products prior to their purchases. Through this role of technology, users share their question, recommendation and opinion of a particular product. When the customer starts to build a relationship with the e-community, there is a tendency that they will stay longer in this site because they gain benefits from there. According to Atherstone, et al, the added value (discussion board) enhance the shopping experience of the customers, this will encourage them to put loyalties to this particular shop. Adrian Jones, also stated that customers feel more secured when they make purchases which had already reviewed by others. The availability of online communities and discussion board also encourages the users to stay longer in the website; customers can browse or click at the recommended books or items link. In a conventional bookshop, the customers may not able to get services like individual book recommendation or variety of book review. Amazon uses mass customization to serve better and enhances individual shopping experience. Upon customer authorization, 1-click system used by Amazon will saves the user information in a secure server. When customer log in to the website, he is entering a personalized page. Besides that, transaction history is also available for Amazon customers. Amazon utilizes this 1-click system to provide a better shopping convenience for its customers. For example, recommendations of related books are shown when customers look for specific title or author. This unique search engine may provide a more comprehensive choice for the users. The large database may also help in determining which products are popular and highly sought by customers. Amazon also gains insight on customer pattern, purchase behavior and purchase pattern. This will enable them to offer a right product at a right time for the right customer. Besides that, customers who did not log in for a specific period of time, Amazon takes the initiative to send them email, reminding them the latest products or promotions. Amazon offers users to create their own wish-list. This wish list allows the customers friends or relative to view what gift he wishes to have. From there, they can buy the gift online and send it to him. This will save them time and hassle of looking for a correct gift for that person. This accuracy information may not available in a normal brick and mortar store. Using the search engine, customers easily (key in keywords on the search tab) able to search for the products they required, comparing with a traditional bookstore where they have to look for books at one bookshelf to another one. Customers who purchases online does not restricted to any time, Amazon operates 24hours, 7 days a week, even on public holidays. Customers does not feel restricted to any time constraint, customers can shop whenever they want, without fear of the shop is closing for the day. Even when they are making their payment, there is no hassle like long queue time. To better serve its customers, Amazon has also other language version of its websites. Amazon has the Spanish, French, Japanese and Chinese version for different customers in different part of the world. Unlike a typical online store which only depend on a single language which is English. This provides convenience to customers in the different corner of the world. Amazon also has customer 8 service centers around different part of the globe. Amazon ensures that customers are able to connect with the organizations regardless where they are. Furthermore, customers also can connect with the 24 hours online help centre. This shows the commitment of Amazon in providing excellence customer service for the customers. Amazon manages the high traffic in the website so that it does not create any laggings in loading the page and performing any transactions. Amazon offers variety of categories for its customers (apparel, automotive, baby, beauty, book, cell phone, electronic, gourmet food, grocery, health and personal care, home and garden, home improvement, industrial and scientific, jewelry, kindle store, magazine, movies and TV, Mp3 download, music and musical instrument.). Therefore Amazon has to work closely with its affiliates and partners. These include securing the line of supplies and also goods return policies. Amazon also constantly updates it tracking system and the shopping cart used by the customers. The information in the database has to be updated from time to time because customers want to track the location of the parcel after they have made payment. Shopping in Amazon may not be as rich experience as shopping in a traditional store. Shopping online get less stimulation (emotional, physical stimulation) compared with shopping in a traditional store. It may also lack of retail excitement, such as bargaining and interacting with other customers in the shop. Amazon customers may also faced difficulties in returning damaged or faulty purchase back to Amazon. Customers have to return back to products through postage, which will cost them and it may takes few days for Amazon to receive it then deliver again to the customers. Although there is customer service centre in few countries, but customer who insist of meeting the customer service representative still have to travel there. Traditional bookstore provides a richer stimulation for customers who patron the shop. Physical products (books) will create part of experience to the customers especially the “touch’ sense. Customers can touch the books, flips through the pages read thru before they decide to purchase it. This able to stimulates them and contribute to part of their customer experience at there. Lighting and layout also contribute to customer experience in Barnes and Noble. The comfortable lighting, sofas at the reading area are life extensive living rooms to customers, where customer can feel relax while reading their books. This creates an emotional bonding with customers at there. Customers also can interact with each another; they share ideas and opinions. Playing soft music, stimulate the “hearing” of customers, Barnes and noble able to create a relax mood and environment, creating a comfortable reading environment for his customers. Customers who buys from Barnes and Noble has a lower perceived risk, they can physically examine the goods before they make payment. Instead of buying a plastic sealed book, customer would prefer to flip through the pages and evaluate the printed materials before they make payment. Besides that, Barnes and Noble may not able to offers lower price to his customers because of high cost for their books. Barnes and Nobles have to maintain its physical stores around the states, this includes total cost likes utilities, building rental, and building maintenance cost. However, there are also weaknesses for brick and mortar shops like Barnes and Noble. The physical presence of other customers in the shop may jeopardize the customer experience there. For example, long queue time and crowded store. The sofas seats maybe limited, when there large crowd, the customers may find it difficult to find a comfortable seat. If the customer is rushing to make payment, the long queue may make him feel disturbed and dissatisfied with the service quality. Customers have to travel to the store to make purchases; furthermore they are only able to visit the store only a certain time. Customers who have busy schedule may not able to drop by the shop to look for books. Amazon.com is able to sustain its market while competitors like Barnes and Noble goes online. Amazon.com has strong brand equity. The large users in amazon.com will serves as the large base for customer references. Customers can get reviews from the large crowd of users. Amazon is able to maintain this relationship through customers and customer interactions and personalized WebPages. Besides that, Amazon.com is able to provide mass customization (personalized page and search result) where the physical store cannot. Barnes and Noble are unable to perform the personalized service for each and every individual customer because it will involve very high cost to do so. Besides that, Amazon.com operating efficiencies allows them to save cost and offers lower price goods to customers; Barnes and Noble has a higher cost to maintain. For the mean time, Amazon has a large database which allows them to data mine for customers buying behavior and purchase trends, this also allows them to formulate a better strategy to address the demand from customers. Amazon business models enable them to offers discounted pricing, fast, ease of purchase and wide selections of goods. Along with the strong brand equity and operating efficiencies, Amazon are able to retain its position as market leader in the virtual space. This student written piece of work is one of many that can be found in our University Degree Marketing section. A brief History of Vodafone and the nature of its business. Enterprise Rent-A-Car - Selling the Dream - related questions. For Nordstrom, it treated employees almost like the extended Nordstrom family, and business variable is closely watched by employee satisfaction. Nordstrom understand that employees will treated customers well if they are treated well buy the company. That is because when employees satisfy with their job and company, they are more willingness to work and serve the customers. information in the application form including gender, nationality, family status, number of children, monthly household income, interests, education level, occupation, etc. If the application is accepted, you will receive one principal card plus three supplemental cards (also called baby cards or mini cards). information about the marketing environment to help marketers identity opportunity and assist in planning . Enterprises should focus more on environmental scanning to detect change in the market as it is extremely important to avoid crisis management. Enterprise has to get in partnership with insurance companies or airlines companies to create more market. through evolution and enhancement of current systems, not a radical change from the way things are done now. In order for Documentum to bridge this gap effectively they need more experience in developing and implementing solutions to shorten transition times and make this a more painless process for the early majority. Financial resource planning is evident. Vodafone disposed of certain interests generating income; Disposal of Orange Plc which was completed in March 2002 generated �2.9 billion. This was as required by the competition commission. Vodafone no longer has any interests whether direct or indirect with Orange Plc. and abides by the relevant government regulations and associations' Codes of Conduct governing members' operations and conduct. ELKEN is an active member of the Direct Selling Association of Malaysia (DSAM), the Direct Selling Association of Singapore (DSAS) and the CTFA (Cosmetic Toiletries of Fragrance Association). and Keller (1998) which has put forth concepts, models to analyse the benefits consumer's seek through the purchase of branded products thus, shaping their attitude towards the product. However, a very few have made any attempt to actually test their concepts by using the established products for this research. (Monsuwe et al, 2004).The number of people that have access to the internet is one of the most important factors that determine the usage of online shoppers. (Jayewardene & Foley, 2000). As cited in Bagdoniene and Zemblyte (2009) about a quarter of the world uses the internet.